L-R: Krystina Alabado and Leah Hocking in THE MAD ONES. Photo by Richard Termine. 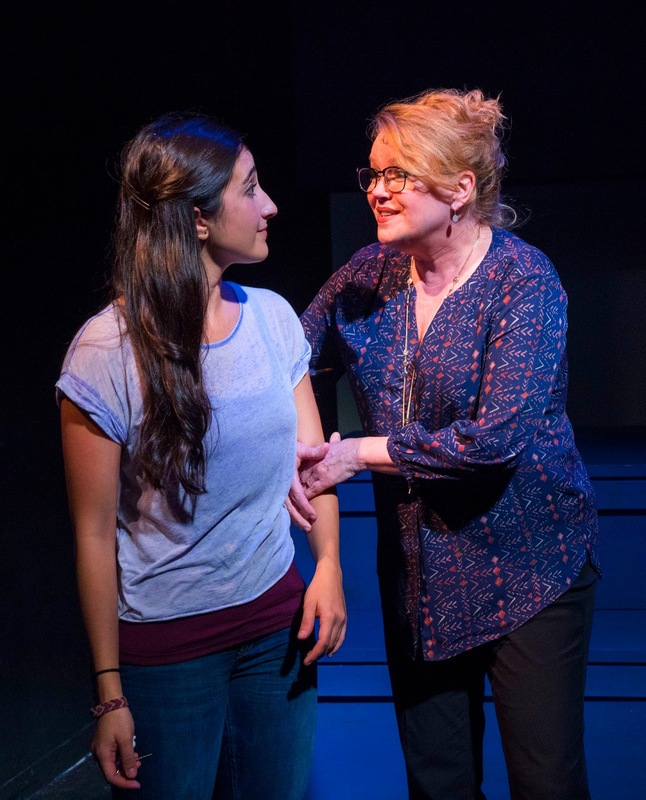 The Mad Ones by Kait Kerrigan and Brian Lowdermilk, currently premiering at 59E59 Theaters in midtown Manhattan, is a rather traditional coming-of-age story set to music. It revolves around Samantha Brown (Kristina Albado), the female valedictorian of her high school class, as she seeks to steer her own course in life while being buffeted by her well-meaning but strongly opinionated mother, Beverly (Leah Hocking); her cool, impulsive and free-spirited best friend, Kelly (Emma Hunton); and her genially laid back and loyal boyfriend, Adam (Jay Armstrong Johnson). Beverly is a brilliant, Harvard-educated, tenured professor of statistics who knows exactly what she wants for Sam: she expects Sam to attend her alma mater almost as a matter of course. Kelly knows what she wants too (at least some of the time): she is a bright, solid-B student, planning to attend the state university and hopeful that Sam will accompany her there, rather than going to Harvard or one of the other Ivies. (Except, of course, when Kelly’d rather chuck it all and just take off for anywhere else.) And Adam is certain of what he wants as well: he’d like to skip college, take over his father’s tire shop – and hang on to Sam. It is only Sam who doesn’t really know what she wants. Sam’s coming-of-age story is presented metaphorically as if it were to be one long road trip. Her principal rite of passage is passing her driver’s test – which certainly is much more meaningful than the loss of her virginity to Adam or any transactions she might have at CVS. Her guidebook is Jack Kerouac’s “On the Road.” And the road trip she ultimately takes will be taken with Kelly. Or with Adam. Or inevitably alone.